Story - Debra Fallowfield makes custom jewellery to fall in love with … Crafting every piece entirely by hand..
Juxtaposing rough with smooth, fine with contemporary ,Debra Fallowfield has been at the forefront of jewellery in New Zealand for near on 15 years, with work that continually pushes boundaries between contemporary and fine jewellery. 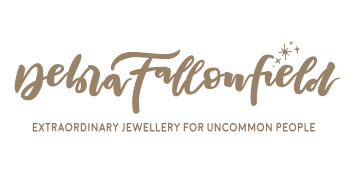 Specialising in truly unique one of a kind handmade jewels. 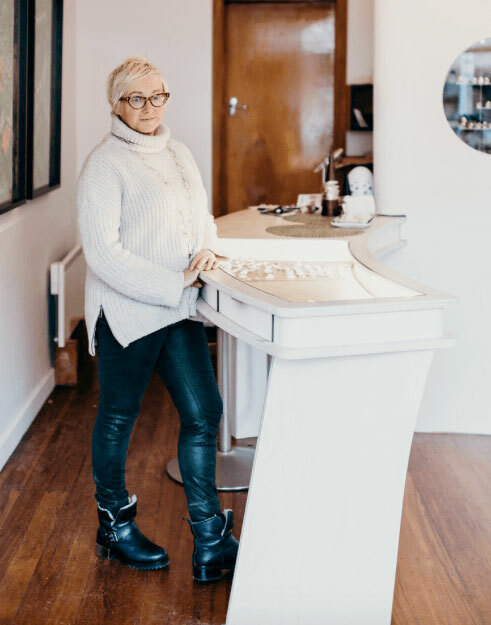 Her work is “Miles away from the mainstream” – A refreshing change in a jewellery market saturated with cheap mass produced replicas. 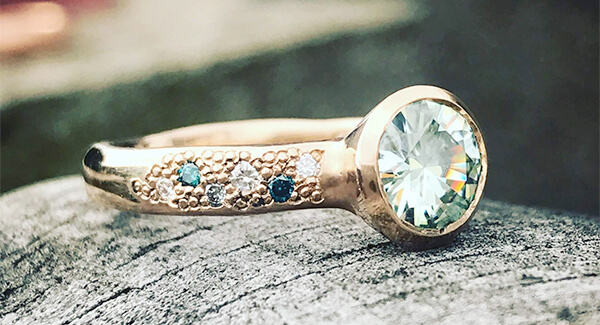 Signature pieces include unashamedly bold and solid wedding/commitment bands in gold, set with diamonds or rainbow hued gemstones, alternative engagement rings, wide bangles with inspiring inscriptions and anything that pushes the envelope. Inspiration for her work is as varied as her designs, from ancient civilisations, to landscapes and often showcases her love for New Zealand and Australia (having lived in Sydney for nearly 12 years in her 20’s). In 2011 Debra’s world came crashing down and she lost her city studio/gallery with much of her tools in Christchurch’s devastating Feb 22nd Earthquake – however she was incredibly lucky not to have lost her life. For nearly 3 years after the event she worked in a tiny closet like space off the laundry, and held wedding ring consultations at her kitchen table. In 2014 Debra her husband and teenage son decided to move to Dunedin where Debra grew up, settling in creative Port Chalmers – just out of Dunedin. 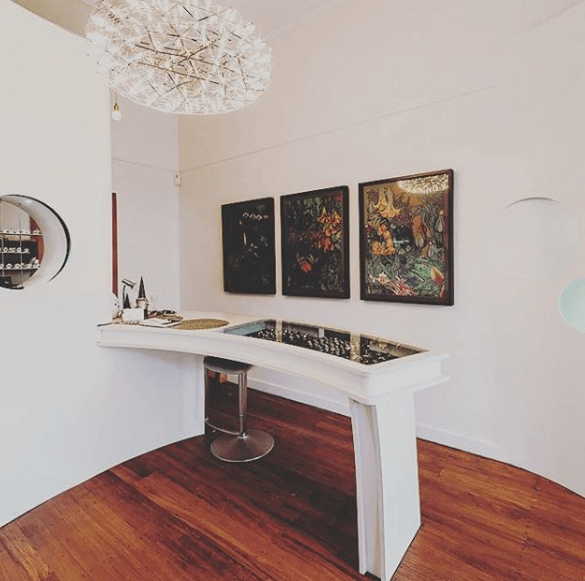 Debra still works from home – but also has a beautiful gallery store on George Street, Port Chalmers. 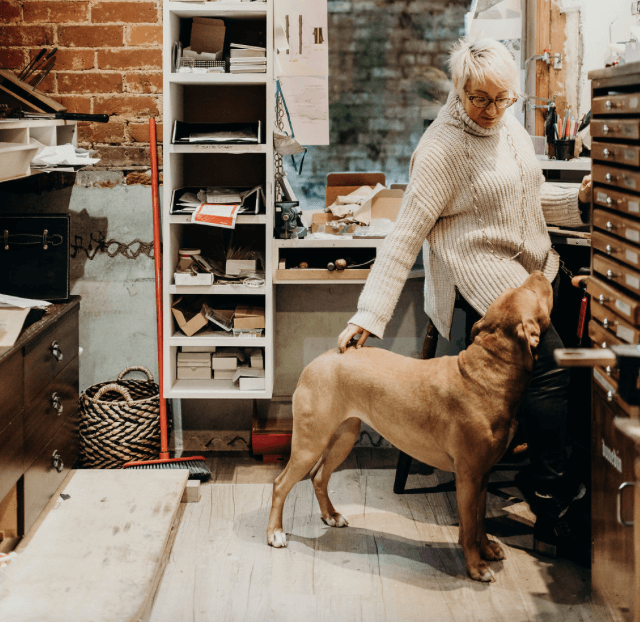 Debra’s shop in Port Chalmers (just 15 minutes drive from Dunedin) is as custom made as her creations. Designed and built by her equally as creative husband, it features sweeping curved walls and inset round cabinets to mirror her work. Here you will find a huge selection of amazing pieces! We do advise you call / text us first to check we are open.